This post brought to you by Elizz. The content and opinions expressed below are that of Teddy Out Ready. It is not easy to care about another person. It does not matter if it is about little baby, aging parents, a relative or a friend. We all somehow become caregivers in our lives. Caregiving is stressful and physically challenging, it takes much of your time, energy and resources. Though it did not scare me at first when I started to care about our parents, I love them so much that any difficulties seemed to me absolutely insignificant and irrelevant. When my parents retired, out of stressful job and long commute, first, they were very excited to have a lot of free time to do what they like. New changes were not easy later, as they lost their everyday social connections and communicated mainly with own children and grandchildren. My mom often complained that she was locked in her house and had no places to go. So we started seeing each other more often, travelling and spending time together. From few hours a week our caregiving developed into new stages and now we need to take care of our parents due to their age and health concerns. I am happy we can take care of our parents and do not wish other life. Everything was not smooth as we expected. I had days in my life when our emotional connections started to fade and we stopped talking about adventures, books, travels, ideas or celebrations as we used to. The communication between me and parents became limited to chores and basic needs. They started feeling like a burden in my life and I was getting some not so pleasant complains and remarks on how I do certain things. Like Natasha’s house is always cleaner than ours or Leon always remembers everyone’s birthdays. My mom started (sometimes inadvertently) to compare herself to ladies from other families and, if she deserves better care. One day, I lost my patience and did not wish to say anything nice, even knowing that it was so important. Sometimes verbal expressions keep you from being nice. I eventually realized it was a result of aging, retirement and some unfulfilled dreams or goals that influence people to search, question and even complain. Luckily, we managed to overcome these difficulties thanks to advice and support of more experienced caregivers and our community. Being a caregiver means you learn something new every single day, for example how to share our responsibilities, how to keep work-life balance, organize multi-generation activities, how to be active together and many other things that make our life as a family easier and less stressful. I am glad I came across Elizz, because we do not have opportunities to visit counselling services and wait for support and conversation we need right now. Just a few words, a virtual pat on your back, informative articles like this one: Caregiver isolation and loneliness - finding mutuality, a forum and chat any time of the day or night makes me feel much better. It is good to know that we are not alone in our situations and always can rely on professional advice. Are you a caregiver? Share your tips, communicate, ask and learn, we are all here at Elizz to create positive caregiving experience. Which Elizz caregiver services are right for you? 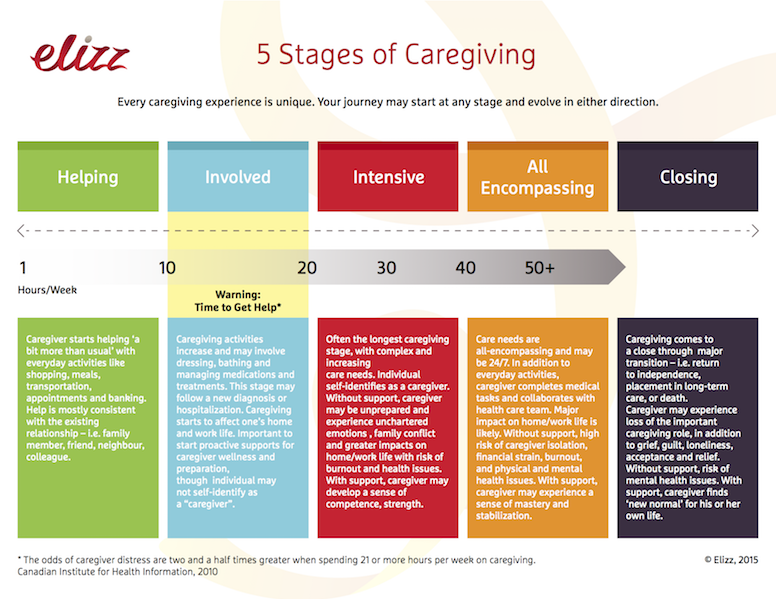 Take 5 Stages of Caregiving Quiz to find out.